Dreams of Diablo-ish danced in my head and I started on an epic journey of RPG design. I read books, talked to wise sages roaming cyberspace and started prototyping. But this did not go well. I was trying to make something new. Something different. But again it wasn’t fun. Frustrated, I switched to some space combat nonsense which had me tracking down ancient and out of print Star Trek games on eBay. Mockups were made. Designs were discussed. And focuses shifted from tactical to arcade. Then a spark ignited at the RPG camp, so I beamed down back to that domain. But still, after a few more weeks, none of the prototypes screamed “awesome” (or even “mediocre”). It was 2 months with nothing solid to show for it. I was getting depressed to say the least. I knew the only way to shake myself out of this slump was to spend a day dreaming about new ideas that could excite me and jump start the creative spirit. I started the morning with Word (<pose>word!</pose>) and Fireworks open. As a side note, Fireworks is my fave tool for mockups. I let my mind wander and came up with 2 pretty solid concepts, with one being a pixel focused game that became Pixel Shift. It all started with Puzzle Quest. I think about that game a lot, stalker-a-lot. It made a great experience by the shotgun wedding of match-3 and RPG mechanics. But the last thing I wanted to make was yet another match-3 game. I was thinking about the mechanic and I liked the idea of moving gems around. Then I had the idea of forming images from the gems, such as shields and swords to trigger RPG combat actions. The colors for the images would have to already exist in the puzzle and not fall into place. 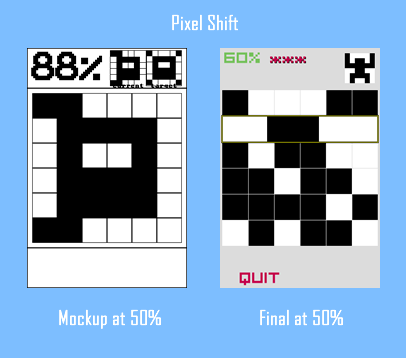 That led to the game mechanic in Pixel Shift. All the puzzle pieces are there, just scrambled. And as a result, it plays like a flat Rubik’s cube, which I didn’t realize until I had to explain the game concept to a friend on the phone. Here is a side by side comparison of the actual mockup and the final game at 50%. I removed the mockup’s current state mini map in an early build since it was redundant. It took 2 months to go from idea to release, but I was moving at about half speed, so it was about a months worth of full development. I also took my time letting feedback from friends sink in and process. Stay tuned for the gritty tech details in a future post.